Flower and fruit are major contributors to food and feed. 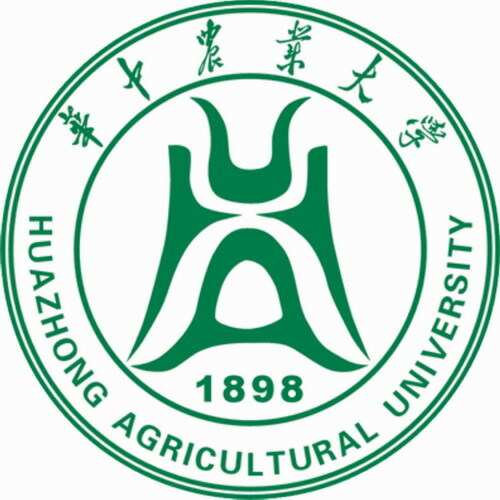 Our lab is interested in understanding the basic mechanisms controlling flower and fruit development as well as translating that knowledge into solutions for agriculture. 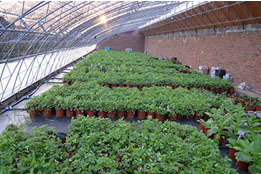 We use two different plant systems, wild strawberry (Fragaria vesca) and Arabidopsis thaliana. 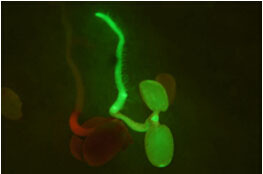 A strawberry seedling containing a GFP transgene. 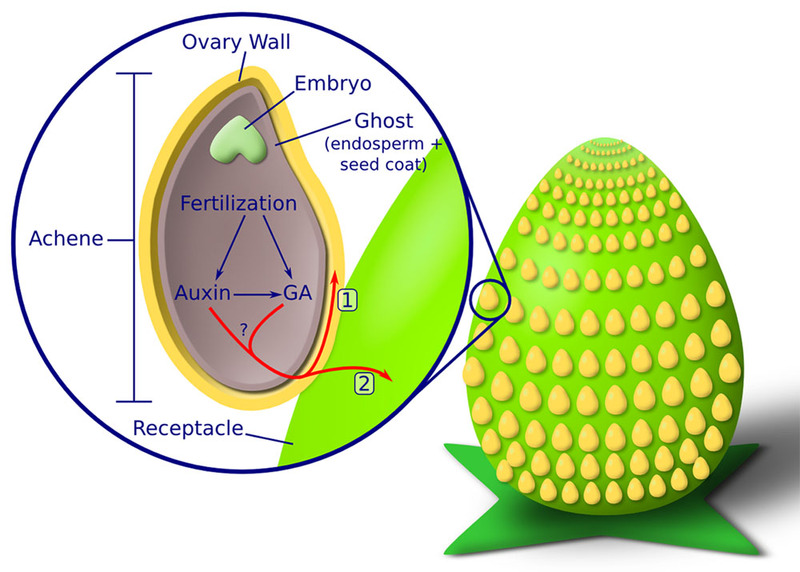 RNA-seq analysis showing increased expression of auxin and GA biosynthesis genes in the endosperm and seedcoat (ghost). Our work in wild strawberry, Fragaria vesca, represents a relatively new research direction. We chose to work on F. vesca because it offers many advantages over garden strawberry. F. vesca is diploid while the garden strawberry is octoploid. In addition, F. vesca has a small and sequenced genome (200-250 MB), a short life cycle (3.5 to 4 months), and a facile transformation system. We are interested in dissecting the molecular mechanisms underlying fruit initiation in strawberry. 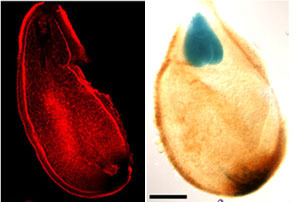 Genome-wide transcriptome (RNA-seq) analysis of 25 different and finely dissected tissues of the strawberry fruit led us to propose a model, in which the biosynthesis of auxin and GA is induced in the endosperm of the fertilized seed and is responsible for strawberry's fleshy fruit initiation (Kang et al., Plant Cell, 2013). In addition, we applied Laser Capture Microdissection and RNA-seq to investigate the development of the receptacle, an understudied floral structure, which is the precursor to the fleshy fruit of strawberry. We found similar molecular networks between young floral meristem and the developing receptacle (Hollender et al., Plant Cell, 2014). In parallel, we are developing additional resources for F. vesca to facilitate the establishment of F. vesca as a model system for studying other fruit crops in the Rosaceae family including apple, peach, cherry, and others. These resources include a website (SGR: Strawberry Genomic Resources http://bioinformatics.towson.edu/strawberry/), extensive RNA-seq data for flower and fruit development (http://www.rosaceae.org/node/3888643), detailed description of morphological changes and landmarks during flower and fruit development to facilitate data comparisons (Hollender et al., Planta 2012), re-annotation of the F. vesca genome based on our RNA-seq data (Darwish et al., BMC Genomics, 2015), and an EMS mutagenized wild strawberry mutant population. Our work in strawberry has been supported by the National Science Foundation; more project details can be found in the project site (GEPR: Flower and Fruit Development in Diploid Strawberry). A Model of Strawberry Fruit Development. 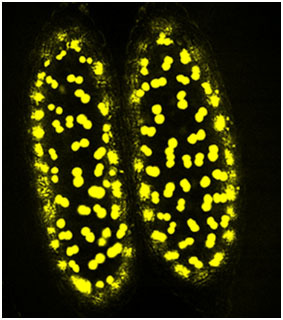 Confocal image of propidium iodide-stained seed Inside an achene and a seed expressing the pPIN1::GUS reporter in the seed. 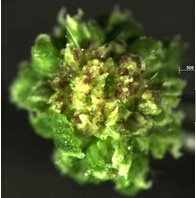 We have previously identified an Arabidopsis mutant, tso1-1 (meaning ugly in Chinese), which showed fasciated inflorescence meristem (Liu and Meyerowitz, Development, 1995). The phenotype indicates the development of more stem cells in the shoot apex, but how the TSO1 protein regulates proliferation of stem cells in the shoot apex remains unknown. The TSO1 protein contains two CXC repeats that may function in DNA binding and chromatin regulation (Song et al., Development, 2000). 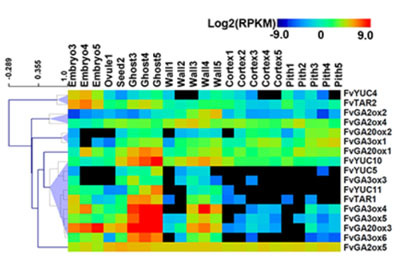 Current efforts are in the identification of TSO1 interacting proteins and downstream target genes using a variety of molecular genetic tools, including genetic screens, yeast-two hybrid, BIFC, CRISPR-based gene knockout, RNA-seq and ChIP-Seq in order to determine the specific pathway(s) in which TSO1 may act to regulate stem cell homeostasis. Diatoms, a class of marine microalgae, are estimated to contribute 20% to 40% of the global photosynthetic productivity, suggesting efficient metabolic networks in this organism. 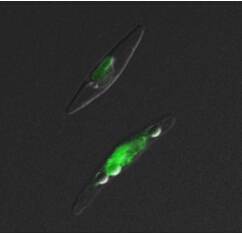 Since 2013, we have been collaborating with Dr. Ganesh Sriram at A. James Clark School of Engineering (http://www.ench.umd.edu/faculty/sriram) to investigate novel biochemical pathways that drive diatom's unique metabolic pathways. We use the model unicellular diatom Phaeodactylum tricornutum, which has a sequenced genome and can be transformed. We are developing further molecular genetic tools, particularly gene knockouts, for this organism.